Quite often we are asked which mix is best for a certain application or frequency range and there is a lot of misinformation on the internet and elsewhere regarding the selection of proper mix for a given application. There are two basic ferrite material groups: (1) Those having a permeability range from 20 to 850 µ are of the Nickel Zinc (NiZn) class (mix 43, 52, 61), and (2) those having initial permeabilities above 850 µ are usually of the Manganese Zinc (MnZn) class (Mix 31, 73, 75). The NiZn ferrite cores (mix 43, 52, 61) have low permeability, exhibit high volume resistivity, moderate temperature stability and high ‘Q’ factors for the 500 KHz to 100 MHz frequency range. They are well suited for low power, high inductance resonant circuits. Their low permeability factors also make them useful for wide band transformer applications. Nickel-zinc ferrites have a higher resistivity and are used at frequencies from 2 MHz to several hundred megahertz. The exception is common mode inductors where the impedance of NiZn material is recommended from 70 MHz to several hundred GHz. 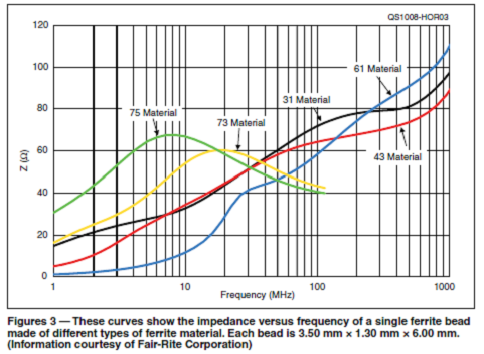 Palomar Engineers uses mix 31, 43, 52, 61, 73, 75 and 77 for most applications from RFI/EMI common mode suppression, multi-ratio toroid baluns and ununs and sleeve baluns for line isolation. 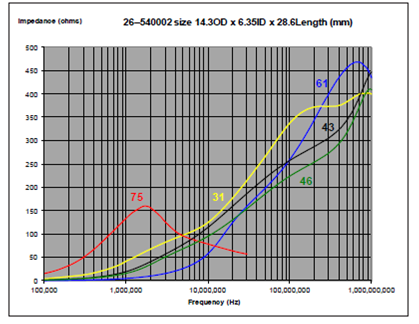 Each mix number has a measurable permeability and suggested frequency range for certain applications. (6) The Jerry Sevick, W2FMI broadband transformers (baluns/ununs) used a permeability of 250 (Mix 52) and the F240-52 ring toroids are ideal for replicating his designs. 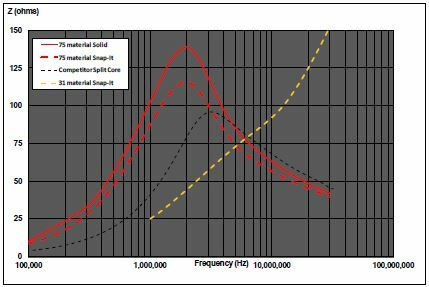 When selecting a mix to use for tuned circuits or broadband transformers, the frequency range should allow for operation in the INDUCTIVE range of the ferrite mix frequency curve. 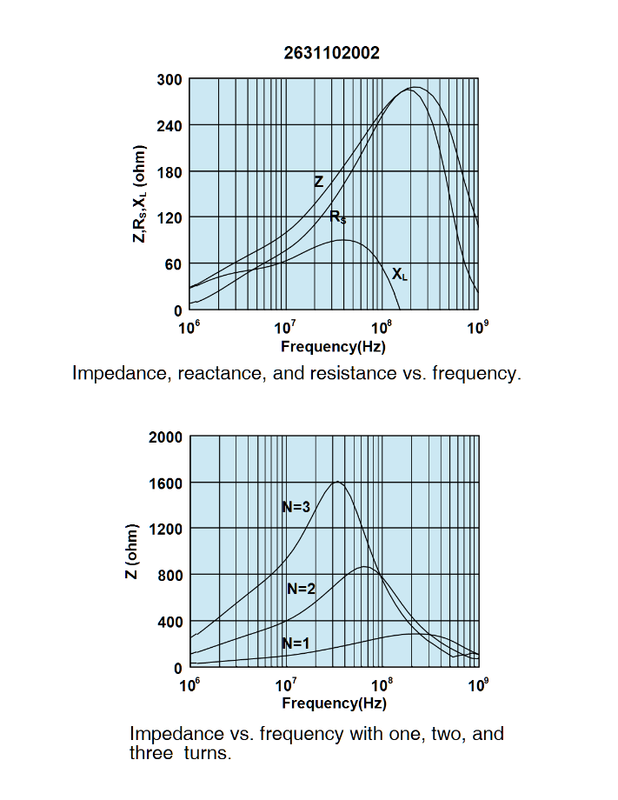 For best results use the proper mix with RESISTIVE dominate range for RFI/EMI suppression at the fundamental RFI frequency. Mix 31 is only appropriate for 1:1 impedance transformers and for RFI suppression from 1-300 MHz and should not be used for <1:1 or > 1:1 impedance transformers as the material resistivity is high over 5 MHz. We have experienced excellent RFI common mode suppression under 5 MHz with mix 75 and mix 77 using multi-turn toroidal topology. For RFI/EMI suppression remember to select the mix which includes the INTERFERING signal frequency. E.g. if AM broadcast is affecting your 7 MHz ham receiver, choose mix 75 which is effective at AM broadcast frequency RFI choking. If your 160 meter signal is affecting your DSL or computer try mix 75 (F240-75) on the power line to the effected device as well as the signal source as the AC line often acts as an “antenna” at these frequencies picking up common mode current. Ferrite is a class of ceramic material with useful electromagnetic properties and an interesting history (see below). Ferrite is rigid and brittle. Like other ceramics, ferrite can chip and break if handled roughly. Luckily it is not as fragile as porcelain and often such chips and cracks will be merely cosmetic. Ferrite varies from silver gray to black in color. The electromagnetic properties of ferrite materials can be affected by operating conditions such as temperature, pressure, field strength, frequency and time. There are basically two varieties of ferrite: soft and hard. This is not a tactile quality but rather a magnetic characteristic. ‘Soft ferrite’ does not retain significant magnetization whereas ‘hard ferrite’ magnetization is considered permanent. Fair-Rite ferrite materials are of the ‘soft’ variety. Ferrite has a cubic crystalline structure with the chemical formula MO.Fe2O3 where Fe2O3 is iron oxide and MO refers to a combination of two or more divalent metal (i.e: zinc, nickel, manganese and copper) oxides. The addition of such metal oxides in various amounts allows the creation of many different materials whose properties can be tailored for a variety of uses. Ferrite shrinks when sintered. Depending on the specific ferrite, this shrinkage can range from 10% to 17% in each dimension. Thus the unfired component’s volume may be as much as 60% larger than the sintered value. Maintaining correct dimensional tolerances as well as the prevention of cracking and warpage related to this shrinkage are fundamental concerns of the manufacturing process. Much later, the first application of magnetite was as ‘Lodestones‘ used by early navigators to locate magnetic North. In 1600 William Gilbert published De Magnete, the first scientific study of magnetism. In 1819 Hans Christian Oersted observed that an electric current in a wire affected a magnetic compass needle. With further contributions by Faraday, Maxwell, Hertz and many others, the new science of electromagnetism developed. Q: Do I need to protect the parts in an outdoor application? A: Ferrite material by itself (no conductor or plastic enclosure) is fairly inert when it comes to adverse environmental conditions, electrical properties do change with temperature. Concern with conductors is the same as with any other electronic component. Plastic cases are polypropylene and can degrade with UV exposure over time, additionally the plastic cased parts are not really intended for outdoor or extreme temperature installations. If used in such environments: it would be judicious to wrap a robust tape, nylon cable tie or other holding mechanism around the plastic case for security as the plastic can deform at temperatures below 0 deg C. or above +85 deg C.
Q: How are solid cores secured to a cable? A: Typical solutions are a tie wrap on the cable at each end of the core, over mold, heat shrink tubing or tape. Q: Can you supply the ECCN (Export Control Classification Number)? Q: What is the max temperature that a ferrite core can be subjected to before permanent damage occurs? A: Generally speaking it is the material type’s Curie Temperature, where the ferrite loses its magnetic properties; when the temperature returns to below Curie, the magnetic properties return but, in some instances, not to where they were before the exposure to high temperature. Physically, electrical and magnetic performance aside, ferrites can withstand temperatures in excess of 1000 deg C without melting but can crack due to fast temperature change.